SHEPHERD Chartered Surveyors is offering a former car showroom and workshop in Dumfries for sale or let. 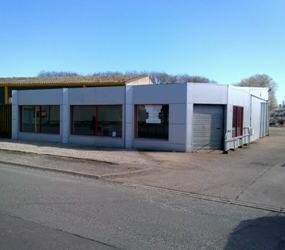 The 2,700 sq ft modern unit with glazed frontage is situated in a prominent position within the busy trade-counter estate at St Mary’s Industrial Estate, a short distance from the A75 Euro route and close to the town centre. The modern detached building offers accommodation including a reception, manager’s office, canteen, and separate staff and customer toilet facilities. Three metal roller shutter doors on the rear elevation provide vehicular access from a surfaced yard. Outline planning permission for a change of use and erection of an extension to the rear of the building has been granted by Dumfries and Galloway Council. Asking price and rent are available on application.